Wham-a-hammer, bam-a-slamma! The construction crew is back -- but what are they building this time? Crash-a-rumble! Smash-a-grumble! What's at work? Here's a clue: It will clear the ground for you. Bulldozer! Coming through! 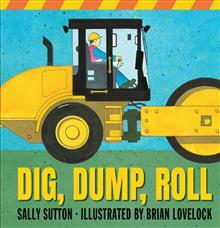 Diggers, dump trucks, rollers, and more -- it takes a l... read full description below. Wham-a-hammer, bam-a-slamma! The construction crew is back -- but what are they building this time? Crash-a-rumble! Smash-a-grumble! What's at work? Here's a clue: It will clear the ground for you. Bulldozer! Coming through! Diggers, dump trucks, rollers, and more -- it takes a lot of big, noisy machines to build a school! Every young child who has ever gawked at a building site will gravitate to this exciting new entry in the kid-pleasing Construction Crew series. Sally Sutton is the author of the Construction Crew series, including Roadwork, Demolition, and Construction, all illustrated by Brian Lovelock, as well as Farmer John's Tractor, illustrated by Robyn Belton. Sally Sutton lives in New Zealand. Brian Lovelock is the illustrator of the Construction Crew series, as well as The Rain Train by Elena de Roo, Did My Mother Do That? by Sharon Holt, and Flight of the Honey Bee by Raymond Huber. Brian Lovelock lives in New Zealand.